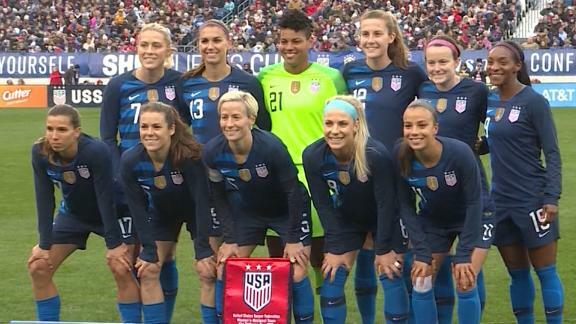 Members of the top-ranked US women's national soccer team on Friday -- about three months before the upcoming World Cup -- filed a federal class-action lawsuit against the US Soccer Federation citing gender discrimination, according to court documents. The suit states that the women filed on behalf of themselves and all other similarly situated current and former women's national team players "who the USSF has subjected to its continuing policies and practices of gender discrimination." The suit alleges that the federation discriminates by paying the women less than members of the men's national team "for substantially equal work and by denying them at least equal playing, training, and travel conditions; equal promotion of their games; equal support and development for their games; and other terms and conditions of employment equal to the MNT." The US Women's National Team Players Association said it is not a party to the lawsuit, but supports the goal of eliminating gender-based discrimination at Chicago-based US Soccer, which governs the senior and youth national teams and recreational teams and leagues. "However, gaps remain," the union said adding it will fight for change through collective bargaining agreements. The July 5, 2015, Women's World Cup title game between the US and Japan was the most watched soccer game in American TV history. The 2019 FIFA Women's World Cup, which will be held in France, starts in June, and the US is one of the favorites to hoist the trophy. It is ranked No. 1 in the most recent FIFA rankings. "Despite the fact that these female and male players are called upon to perform the same job responsibilities on their teams and participate in international competitions for their single common employer, the USSF, the female players have been consistently paid less money than their male counterparts," the lawsuit states. "This is true even though their performance has been superior to that of the male players -- with the female players, in contrast to male players, becoming world champions." This is not the first legal battle between the federation and members of the women's team. In March 2016, five players filed a complaint with the Equal Employment Opportunity Commission, the federal agency that enforces equal pay law. Four of those players are plaintiffs in the new suit: Alex Morgan, Megan Rapinoe, Carli Lloyd and Becky Sauerbrunn. According to the latest suit, Morgan, Lloyd, Rapinoe and Sauerbrunn seek to represent all current or former players who were members of the women's national team at any time since February 4, 2015. The complaint from 2016 was not resolved. However, in April 2017, it was announced that the US Women's National Team Players Association had struck a new labor deal with US Soccer, ratifying a new collective bargaining agreement through 2021. The agreement covered the 2019 FIFA Women's World Cup and the 2020 Olympics. When the deal was announced, CNN reported that in addition to better pay and bigger bonuses, the women received better hotel and travel accommodations and would be reimbursed for the years when their per diems were less than those of the men. Friday's filing was first reported by The New York Times.